During this week which Christians traditionally call holy week, we are given another chance to reflect on and to re-live the last hours of Jesus’ life. All the things brought to our mind by the different expressions of piety which characterize these days are of course directed to the resurrection, which is, as St Paul says, the basis of our faith. But we should not tread this path too hastily, lest we lose sight of a very simple fact which we might easily overlook. We will not be able to share in our Lord’s resurrection unless we unite ourselves with him in his passion and death. If we are to accompany Christ in his glory at the end of Holy Week, we must first enter into his holocaust and be truly united to him, as he lies dead on Calvary. Christ’s generous self-sacrifice is a challenge to sin. We find it hard to accept the reality of sin, although its existence is undeniable. Sin is the mysterium iniquitatis: the mystery of evil, the inexplicable evil of the creature whose pride leads him to rise up against God. The story is as old as mankind. It began with the fall of our first parents; then came the unending depravities which punctuate the behaviour of mankind down the ages; and, finally, our own personal rebellions. It is very difficult to realize just how perverse sin is and to understand what our faith tells us. We should remember that even in the human context the scale of an offence is frequently determined by the importance of the injured party — his social standing, his qualities. But with sin man offends God, the creature repudiates his creator. But “God is love.” The abyss of malice which sin opens wide has been bridged by his infinite charity. God did not abandon men. His plans foresaw that the sacrifices of the old law would be insufficient to repair our faults and re-establish the unity which had been lost. A man who was God would have to offer himself up. To help us grasp in some measure this unfathomable mystery, we might imagine the Blessed Trinity taking counsel together in its uninterrupted intimate relationship of infinite love. 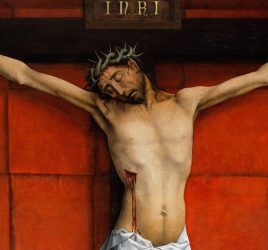 As a result of its eternal decision, the only-begotten Son of God the Father takes on our human condition and bears the burden of our wretchedness and sorrows, to end up sewn with nails to a piece of wood. Christ’s whole life, from his birth in Bethlehem, was filled with a burning desire to carry out the saving decree of God the Father. 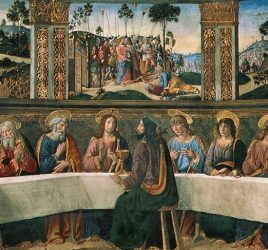 Throughout the three years his disciples lived with him, they constantly heard him say that his food was to do the will of him who sent him. And so it was, right up to the afternoon of the first Good Friday when his sacrifice was completed. “Bowing his head, he gave up his spirit.” That is how St John the Apostle describes Christ’s death. Jesus dies on the cross beneath the weight of all the faults of men, crushed by the sheer force and wickedness of our sins. Let us meditate on our Lord, wounded from head to foot out of love for us. Using a phrase which approaches the truth, although it does not express its full reality, we can repeat the words of an ancient writer: “The body of Christ is a portrait in pain.” At the sight of Christ bruised and broken — just a lifeless body taken down from the cross and given to his Mother — at the sight of Jesus destroyed in this way, we might have thought he had failed utterly. Where are the crowds that once followed him, where is the kingdom he foretold? But this is victory, not defeat. We are nearer the resurrection than ever before; we are going to see the triumph which he has won with his obedience. We have-just been re-living the drama of Calvary, which I would dare to describe as the first, the original Mass, celebrated by Jesus Christ. God the Father delivers his Son up to death. Jesus, the only Son of God, embraces the cross on which they have condemned him to die, and his sacrifice is accepted by his Father. As a result of that sacrifice, the Holy Spirit is poured out upon mankind. The tragedy of the passion brings to fulfilment our own life and the whole of human history. We can’t let Holy Week be just a kind of commemoration. It means contemplating the mystery of Jesus Christ as something which continues to work in our souls. The Christian is obliged to be alter Christus, ipse Christus: another Christ, Christ himself. Through baptism all of us have been made priests of our lives, “to offer spiritual sacrifices acceptable to God through Jesus Christ.” Everything we do can be an expression of our obedience to God’s will and so perpetuate the mission of the God-man. Take a look now at Calvary. Jesus has died and there is as yet no sign of his glorious triumph. It is a good time to examine how much we really want to live as Christians, to be holy. Here is our chance to react against our weaknesses with an act of faith. We can trust in God and resolve to put love into the things we do each day. The experience of sin should lead us to sorrow. We should make a more mature and deeper decision to be faithful and truly identify ourselves with Christ, persevering, no matter what it costs, in the priestly mission that he has given every single one of his disciples. That mission should spur us on to be the salt and light of the world. 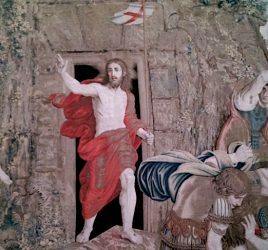 “Christ’s Death is the Christian’s Life” is an excerpt from the homily given by St. Josemaria Escriva on Good Friday, April 15, 1960. The homily is published by Scepter Publishers in the book “Christ is Passing By”. 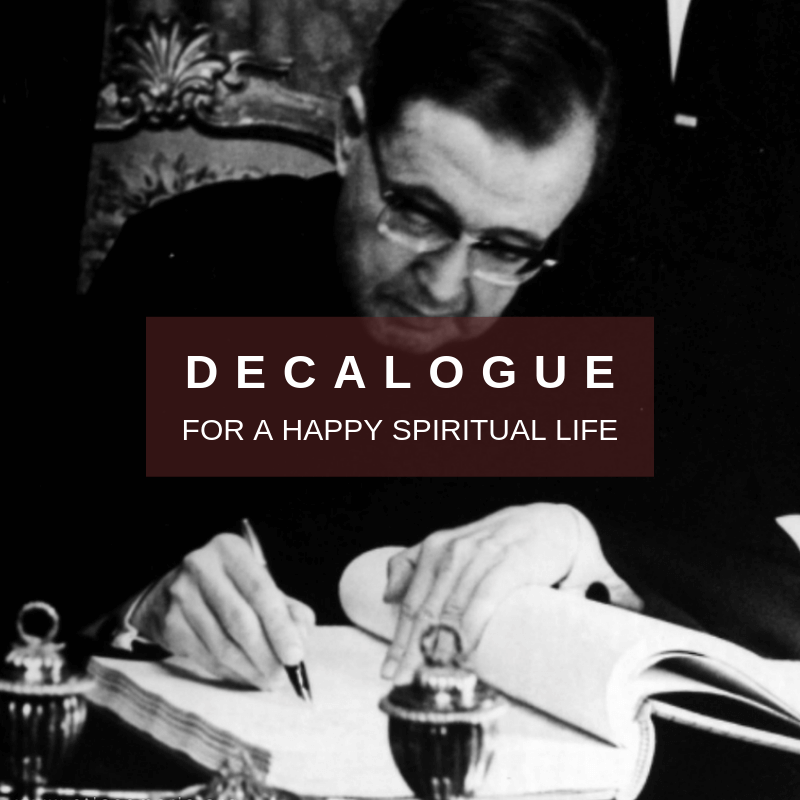 Reproduced by the St. Josemaria Institute courtesy of the Studium Foundation. The content is intended for the free use of readers and may not be copied or reproduced without permission from ©The Studium Foundation (www.escrivaworks.org).